Cuban President Raul Castro with President Barack Obama at the Palace of the Revolution in Havana, Cuba, March 21, 2016. According to Russian experts, the "reset" of Cuban-American relations will not lead to competition between Russia and the United States. U.S. President Barack Obama finished a two-day trip to Cuba on March 22, a visit that has already been dubbed "historic." The last time thatan incumbent U.S. president put his feet on the groundon the island was 88 years ago. Washington's embargo, which has lasted for more than half a century, and the complete rupture of diplomatic relations, made the island the last hotbed of the Cold War in the Western Hemisphere. 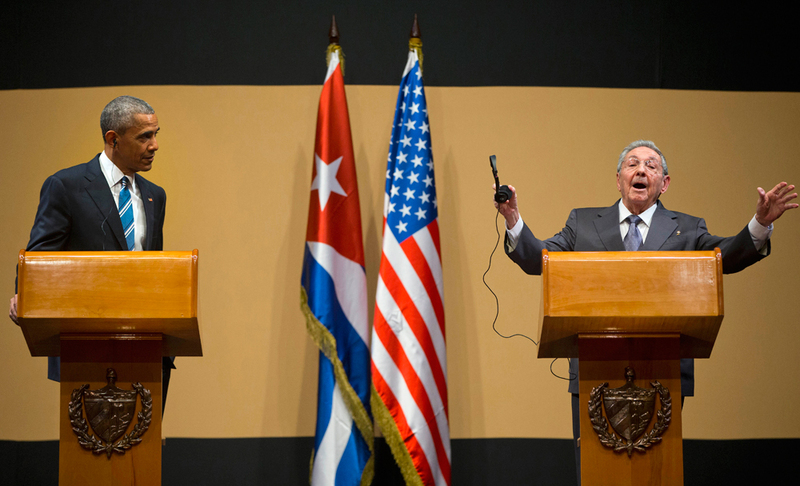 The bilateral meeting of Obama with Cuban leader Raul Castro has likely put an end tosuch tensions. However, the phrase stated by Castro at the end of the meeting that the parties decided to concentrate "on what unites" them suggests that two key issues – the economic blockade and the naval base at Guantanamo Bay – will remain unresolved for now. Obama said ahead of his visit that his main intention was to restore relations primarily with the people of Cuba, rather than with the government and the state. Sanctions against Cuba were introduced by the U.S. Congress, which passed hundreds of restrictive laws over the course of 53 years. The full sanctions can only be lifted by Congress. In addition, the Republican majority in Congress is likely to be a serious obstacle to such a move, says Mikhail Belyat, an expert on Latin America and a researcher at the Russian State University for the Humanities. With regard to the Guantanamo Bay Naval Base and the prison of the same name, its closure is also not being seriously discussed, even though it was one of the Obama campaign's central promises in 2008. Cuba considers it occupied territory, while several political issues in the U.S. have prevented its closure thus far. This outcome of the negotiations fully suits Moscow. In fact, it means the establishment of economic relations between Cuba and the U.S., which does not interfere with Russia-Cuba ties in their current state. Moscow simply does not have any ambitious projects related to Cuba today. The U.S. and Cuba were equally in need of a paradigm shift in relations, Russian experts say. "Cuba is very interested in this, as it has no energy sponsors after Venezuela ceased to fulfill its obligations,” says Vladimir Sudarev, professor of the Department of History and Politics of Europe and America at the MGIMO University. For a long time, Venezuela supplied half of Cuba’soilpractically for free. Now it can be expected that sustained investments will come from U.S. However, funds will not likely go to the energy sector, but the tourism industry. Obama clearly demonstrated his economic intentions, arriving with a large business delegation. A day before the visit, air traffic between the two countries, which was interrupted 53 years ago, was resumed, and the American hotel chain Starwood Hotels & Resorts Worldwide signed its first deal in Cuba. The main economic competitor in Cuba for the U.S. will not be Russia, but China. For the first three quarters of 2015, trade between Cuba and China increased by 57 percent – up to $1.5 billion – and China is now in second place among Cuba's trade partners; the first place is still occupied by Venezuela. "This is not a threat to our plans"
But perhaps Obama's most important benefit from his Cuban tour was the opening of doors into the rest of Latin America. Most Latin American countries supported Havana in its opposition to the U.S. and condemned its economic embargo on Cuba. Now this element, which greatly bedeviled Washington's relations with its Latin American neighbors, has simply been removed from the agenda. At the same time, the U.S. is unlikely to succeed in smothering the Cubans with their embraces. Cuban leaders do not intend to abandon their position and change the political system, emphasizes Vladimir Davydov, the director of the Institute of Latin America at the Russian Academy of Sciences. To avoid falling into the American trap, the Cubans will apparently endeavor not to put all of their eggs into one basket. This is where Russia could act as a counterweight. "We almost left Cuba in the early 1990s, abandoning facilities and much more," Davydov says. Today, Cuba could hardly be called a coveted prize for Russia, all experts interviewed by RBTH agree, although Moscow has beenable to implement a number of projects in the oil and gas industry and metallurgy. Also, the Kremlin sees no reason for concern in connection with U.S. activity in the region. Rather, it is perceived as a return to normal relations. "This does not threaten either our prospects or our plans on the continent, which are rather modest, I should say," says Belyat. And yet, Moscow seems to be restoring its ties with Havana, albeit slowly. One needs only recall that Russia forgave Cuba $30 billion in debt in 2014 and provided a loan of 1.2 billion euros for the construction of power plants at the end of 2015.